The airing of Tim’s Nessie film on the BBC's Panorama programme sparked the curiosity of David James, a Member of the British Parliament. He, along with prominent naturalist Peter Scott (later to become Sir Peter Scott) co-founded the Loch Ness Phenomena Investigation Bureau in 1962. 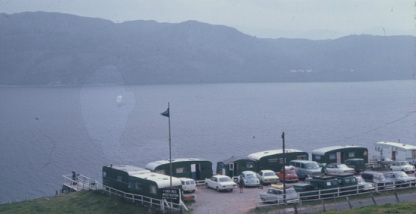 From humble beginnings the LNIB, as it became known, developed into a volunteer organisation where folks would donate their time watching for Nessie from various vantage points up and down the loch. Year on year the small operation grew, expanding from two-week stints to much longer duration; eventually the expedition ran the entire summer. To accommodate the expansion and increase in volunteer numbers, a base camp was developed at place called Achnahannet. Situated a few miles west of Urquhart Castle on the loch's north shore, the site had a commanding view of the water. It was the Bureau's base until operations ceased in 1972. Volunteers rose before the break of dawn and drove customized vans to designated places around the loch. 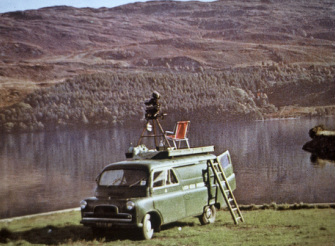 Parked with an uninterrupted view of the loch surface, their job was to sit on top of the vehicle next to a camera mounted with a telephoto lens and keep watch from early morning until dusk. The strategy was simple; positioning mobile camera units at places around the loch where the animal had been seen in the past should, theoretically, increase the chance seeing the creature again. In the summer of 1970, Tim took over the running of operations at the LNIB Achnahannet site. It proved to be an action-packed Nessie hunting season with folks from all corners of the globe arriving to offer their time and energy to help seek the elusive beast. 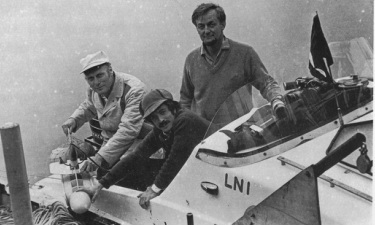 To increase the odds of sighting Nessie still further, Tim employed the services of Wing Commander Ken Wallis to fly his unique, single-seat autogyro up and down the loch. Ken, a veteran World War Two bomber pilot and innovator, designed and built the aircraft himself. He arrived at the loch towing his flying machine behind an Austin mini; the aircraft was so small and light it only needed a hundred feet of smooth ground to get airborne. The purpose of the autogyro was to try and film Nessie from the air. A camera had been fitted below the pilot's seat so if Ken sighted the animal he could swoop down and film it from above. Later that same summer a small group of Americans arrived at the loch. It was to be the first of many visits the Academy of Applied Science would make to Loch Ness. The picture shows Bob Rines (left), Tim (behind) and Dr. Marty Klein (right) loading Marty’s brilliant creation, the side scan sonar unit, onto Water Horse before going on their first outing scanning the loch. The “towfish,” as Marty named the sonar unit, was towed behind Tim’s boat at depth of about 200 feet. The three men trawled up and down parts of the loch for a couple of days recording everything in their electronic pathway. The technology mapped the steep side walls of the loch, confirming for the first time the existence of underwater caverns; the men named these "Klein's caves of Loch Ness." Checking the charts, Marty noted on more than one occasion the electronic devise recorded a contact in mid water. These "hits" were far too large to be classified as fish.